If you live in the Midwest, you know a thing or two about hard water. It is defined by its high concentration of calcium and lime content, and when hard water evaporates, it leaves behind a layer of residue that can be incredibly difficult to clean. When this residue is left to build up in your shower or sinks, you can have a real problem on your hands. Certain areas of the country are considered to have “harder” water than others. Midwest states, including Ohio, Illinois, Indiana, Iowa, Nebraska, Michigan and South Dakota, have some of the most mineral-filled water in the country. Water collects mineral deposits as it moves through underground channels of limestone and chalk. While it’s not harmful for bathing or consumption in regulated amounts, hard water wreaks havoc on grout and tile. It leaves unsightly white or orange deposits on tile and caulk, and this lime scale buildup can eventually damage your grout and caulk enough to require regrouting and recaulking. Why do grout and tile get so dirty without grout cleaning services? Grout is a porous substance, a cement that is filled with microscopic holes. If grout is applied but not sealed, all those tiny pores are susceptible to catching every bit of dust, dirt and grime that comes their way. When hard water comes into contact with grout — like, every time you take a shower or get water on the tiled floor — it seeps into the grout. When it dries, the water is gone, but the calcium and lime deposits remain. Proper grout cleaning services as performed by The Grout Medic involve using a specialized vapor technology to free the material impacted in the porous grout, and wash it away, leaving nothing but clean, fresh grout in its place. We then place a seal over the grout to protect it from further discoloration and damage. The problem with cleaning grout and tiles covered in limescale buildup is that you’re using the very same water that deposited the minerals in the first place. As much as you try to move quickly to clean and dry the grout and tile, that water still has time to penetrate the grout’s pores, only compounding the problem. That’s why a grout cleaning service is so important. Only experts like those with The Grout Medic can effectively clean your grout using methodology designed to remove all the hard water buildup and leave your grout looking new. After every tile cleaning and grout cleaning service, we recommend the application of a grout sealant. 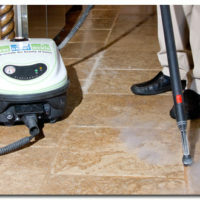 This will cover the grout, keeping moisture, mold and mildew out, and making it easier for you to clean. Have you had enough of unsightly hard water stains and damage? It’s time to call The Grout Medic for tile cleaning and grout cleaning services, along with recaulking, regrouting and water damage repair services.